I should have been more suspicious about the Ferengi salesman I bought my LCARS system from. Ferengi have always been skeptical towards JavaFX. I should have known that this device had been tampered with in order to bring my system down in the middle of my demo at EclipseCon Europe. Ferengi petaq! Nevertheless, I could organize a new working LCARS terminal now and here is my demo. 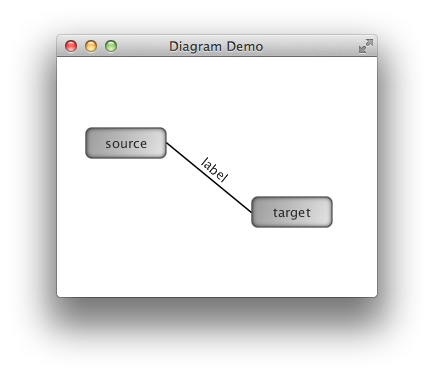 It demonstrates JavaFX's flexibility to create a diagram editor that does neither look like nor behave like a dull lines and boxes editor. I extracted the data from the StarTrek fansite Memory Alpha and stored it in a local mongoDB. The font is from GTJLCARS. SVG export extends some code from the JFXtras project initially written by Gerrit Grunwald. Thanks to all of you, guys. 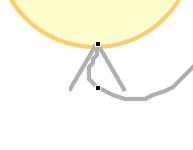 I believe that the Eclipse's diagram editing frameworks have a lot to catch up when it comes to usability. For illustration I've created a screencast on how a typical Eclipse graphical editor appears to a user. I have used the Ecore Tools editor as an example, but most issues presented are caused by defaults of GMF or GEF which are pretty hard to change. So don't be surprised if you re-encounter these or similar issues in Graphiti, Sirius etc. The screencast doesn't even cover the rendering errors described in my previous blog post. Facilitating the development of new editors. This usually causes a restriction to very specific use cases. 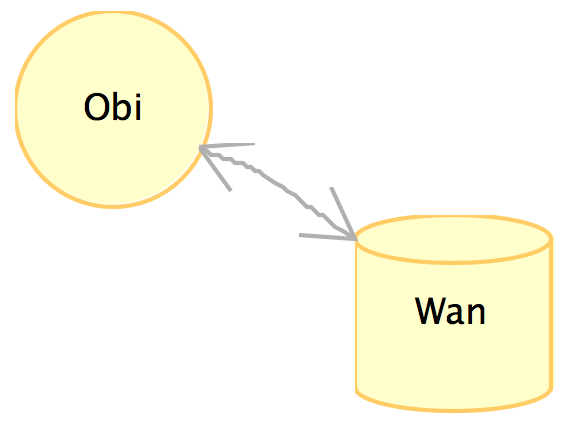 Establishing weird processes to implement new diagram editors. Repeatedly putting new abstraction layers on top of the existing ones. Hide the seemingly ugly or incomprehensible concepts of a base framework. The problem is to find better abstractions that don't leak. In the end you often have to learn both (or more) frameworks in order to use them. Building on top of existing frameworks with serious limitations, like integer coordinates, missing alpha channel, no hardware acceleration etc. Supporting very large diagrams. Yes, there are very big models. But diagrams with hundreds of nodes and connections only make good wallpapers. Creating new compatibility APIs, e.g. to replace the rendering engine. These will limit the available functionality to the common minimum set of features of all backends. Changing a model graphically. Note the difference between editing a diagram – e.g. to make it look nicer – and changing the underlying model. Did you ever wonder why GEF Zest is the only Eclipse diagram framework with its own diagram layout algorithms and basic support for multi-touch gestures? The possibility for individual customization. How do we get there? Attend my talk Eclipse Diagram Editors - An Endangered Species at EclipseCon Europe for some propositions and an extensive demo. I am currently preparing a demo for my talk at EclipseCon Europe 2013. Embedding my JavaFX based graphical editor into Eclipse went smoothly thanks to the FXCanvas that bridges SWT and JavaFX. But I realized that multi-touch gestures did no longer work. I filed a bug for that, but I could not resist trying to find out what's wrong myself. You may not know that the sources of JavaFX are open now. So after cloning their mercurial repo and browsing a couple of classes I found out that SWT's GestureEvents are neither converted to JavaFX GestureEvents nor transferred to an embedded JavaFX canvas. The implementation was simply missing. So with some help by Tom Schindl and Steve Northover (thanks a lot, guys!) I hacked a solution that works fine for me, as you can see in the screencast below. If you're interested you can download my the code from github. 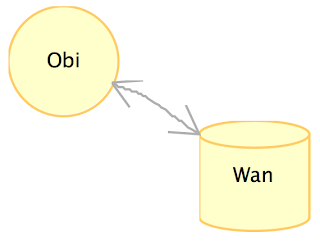 The uncounted latter is often referred to as OBOE or, with a geek sense of humor, "Obi-Wan error". Integer vs. double coordinates is comparable to raster vs. vector images. While in integer coordinates a point usually means a pixel, in double coordinates a point has no area and a line can be infinitesimally thin. In a world of double precision it is obvious that we need some rendering. We are forced to think about things like line width, stroke type, line caps, line joins, miters, etc. There are excellent explanatory pictures on these in the JavaDocs of JavaFX's Shape class. The last screenshot also shows that the line cap style plays a role at the tip of the arrow head. GEF 4 will have double coordinates and Bézier curves. But at the time of writing this blogpost, there hasn't been an official release yet. It is not clear either whether and when it will be adopted by downstream projects. I came across all this when trying to calculate edges and arrow heads for my sparetime JavaFX diagram editor project. Luckily, JavaFX uses double coordinates only. 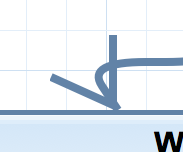 JavaFX also includes quadratic and cubic Bézier curves. These curves are really smooth and drawn fast, though I must admit I'd have expected B-Splines at least. I am going to demonstrate this at EclipseCon Europe 2013. Stay tuned for more. We at itemis have created a bunch of projects with an ‘X‘ during the last years: Xtext, Xtend and Xbase. In this blog post I am trying to elaborate the different use cases for each of them. ...which is a nice language understood by many programmers worldwide. A giant ecosystem and a vivid community as well as great IDEs are keys to its success. But Java has a couple of crucial problems: Its syntax is inflexible and very verbose, making fluent APIs the closest you can get to domain-specific languages. Design patterns and structural conventions as JavaBeans have to be manually implemented over and over again with lot of error-prone boiler plate code. Frameworks require a big deal of XML pointing to Java classes, often ignored by the static analysis at compile time. IDEs can help us here, but they are usually limited to scaffolding or a single way of using a framework. The diagnosis is: Java is lacking the right means of abstraction. All technologies presented in the following enable you to define your own set of abstractions on top of Java. The solutions differ in syntactic flexibility, turnaround times, required user skills and multi-platform coverage. Xtext is a framework for external, textual, domain-specific languages. 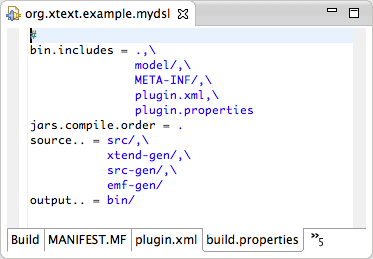 Xtext makes it easy to build an entire IDE for a completely new language, including your own code generators or interpreters to execute it. The Xtext homepage lists a lot of example projects. When should you use Xtext? First of all, when you need a maximum of syntactical freedom. 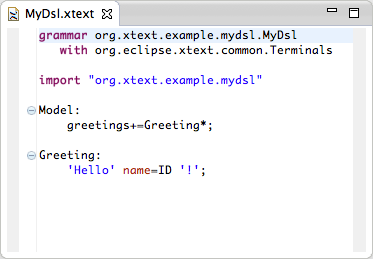 As Xtext DSLs are external they are defined by their own grammar, thus not constrained by the syntax of a host language. Second, use plain Xtext if your language has no correspondence to Java or if you want to avoid dependencies on JDT at all cost. Languages that target different platforms at the same time are most likely based on a plain Xtext-based language, too. The technical skills needed to work with a Xtext-based language IDE is relatively low. I personally do not believe in "programming business men". But Xtext has been successfully used for non-technical, purely domain-oriented languages. 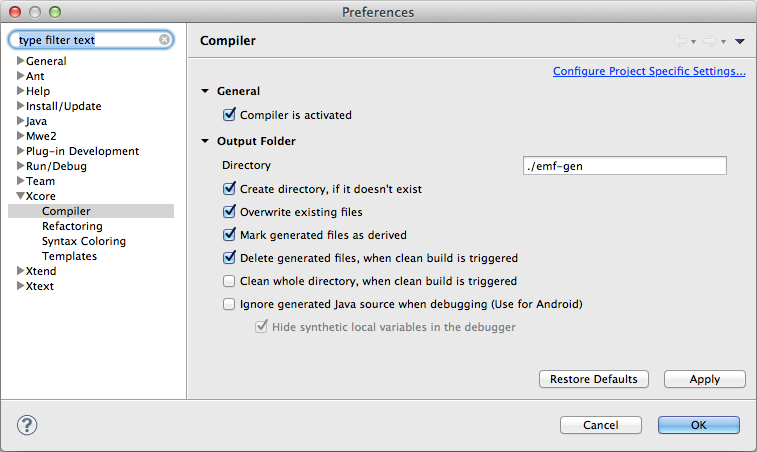 As the generated IDE is already very powerful by default and can be customized easily, some people even use Xtext to build the IDE front end for an existing language with an existing compiler. If you change the grammar, you have to regenerate the language infrastructure and redeploy the language's plug-ins to the user's machines. The latter can be a challenge in some scenarios. 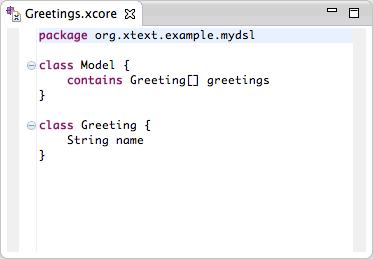 Under the codename Xbase, we have developed a rich expression language, that you can embed in your Xtext-based DSLs. It reuses Java's typesystem, can express everything that Java expressions can do and adds even more features like type inference, operator overloading, lambda expressions etc. The default way of using Xbase is to define a transformation from your language to a structural Java model and embed the expressions in the appropriate Java contexts. A generic code generator builds Java code from this model, so no need to build your own. As we generate plain Java code, these Xbase languages integrate seamlessly with hand-written Java code and work for platforms that are sensitive to bytecode manipulation, like Android. Java DSLs are the way to go for languages that compile to Java and need rich behavior or expressions. These are probably much more than you'd probably expect. Have a look at our seven languages for some examples. There is also an interpreter for Xbase allowing to skip the compilation step on the language user's side. 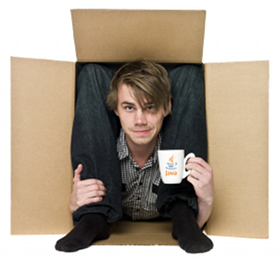 We have only implemented an execution environment for Java, so it's up to you if you need another. Restricting the available expressions is easy and could help here significantly. You can also add new expressions to the expression language, but the syntactic space is already quite crowded. Non-technical users are usually ruled out here. You don't want to teach them managers about closures, do you? You still have complete syntactical freedom for your language. But you still have to regenerate the plug-ins and redeploy them on grammar changes as before. Just because Java doesn't offer the means of abstraction you need doesn't mean you have to define a new language yourself. We have created Xtend, a general purpose language (GPL) based on Java but adding a lot of fancy stuff like type inference, operator overloading, lambda expressions, etc. You guessed it: Xtend is based on the Xbase expression library, but also defines the structural parts (types, fields, methods, annotations etc. ), adds extension methods, multi-dispatch methods, template expressions, and offers an even better IDE. This is already a mighty toolset and can bring you pretty close to internal DSLs in other languages. Look at our examples from EclipseCon 2012 (especially the SWT, Distances and HTML Builder examples). Having everything you need in the language itself gives you short turnarounds as no more regeneration and redeployment is needed. The toolstack stays nicely low. But you're restricted to generating Java and use the syntactical elements of the Xtend language. I would never recommend Xtend to non-programmers, but to everyone fighting with Java. I was a bit vague in my last post on JavaFX's transformation API, so I decided to write a separate post on this topic. In JavaFX, each node in the scenegraph can be translated, rotated, scaled or sheared relative to its parent. In mathematical terms, each node maintains a transformation describing its own local coordinate system. This transformation can be defined with a matrix represented as a Transform object in JavaFX. Unfortunately, these convenience methods do not accumulate as one would expect. Instead of multiplying the matrices for subsequent transformations, the only set specific entries in the matrix. As a result, translating an object before rotating yields the same result as applying these transformations in reverse order. This is mathematically wrong and does also not match the users expectations. In my diagram editor application, I want to scroll (translate), zoom (scale) and rotate the canvas using mouse gestures. From the user's point of view it's imperative that each transformation builds on the previous state. The convenience methods don't match this usecase. The correct solution to this problem is to multiply the transformation matrices. Unfortunately, JavaFX lacks any kind of calculation API for Transform and its subclasses. Once again, this is where Xtend comes to our aid. An extension method in Xtend can be used to define functions for existing (closed) types, which syntactically look like being methods of the type on the caller's side. Affine is a subtype of Transform that allows its matrix entries to change. So I wrote extension methods to translate, rotate, scale and shear an existing Affine by multiplying the respective transformation matrix, e.g. now allows to accumulate the transformations, e.g. The resulting behavior looks like the following screenshot. Note that the mouse position is the pivot for rotations and zoom. PS: I went for mutable transformation matrices, but the same mechnism will hold for immutable matrices. The extension methods then return a new Affine instead of modifying the receiver. Inspired by a talk by Gerrit Grunwald and the work of Tom Schindl I started to dig a bit deeper into JavaFX. Being one of the committers of the Xtend language, it was a matter of honour to use Xtend in my experiments. The result: JavaFX and Xtend seem to be made for each other. If you know me a bit, you won't be surprised that I tried implementing a simple graph editor first. I will blog on that particular application in a separate post. Even though JavaFX is not primarily a graphical editing framework, it offers a lot of the required features, e.g. The developers of JavaFX did a pretty good job in creating a clear Java API, but sometimes Java's rigid syntax was a bit in their way. This is where Xtend comes into play. The resulting code is astonishingly short and easy to read. The with operator also facilitates the creation of object trees, e.g. subtrees of JavaFX's scenegraph.